Himiko the beloved daughter of a chieftain in third century Japan has always been special. The day she was born there was a devastating earthquake, and the tribe's shamaness had an amazing vision revealing the young girl's future—one day this privledged child will be the spiritual and tribal leader over all of the tribes. Book One revolves around the events of Himiko's early teen years—her shaman lessons, friendships, contact with other tribes, and journey to save her family after a series of tragic events. Once again, Esther Friesner masterfully weaves together history, myth, and mysticism in a tale of a princess whose path is far from traditional. 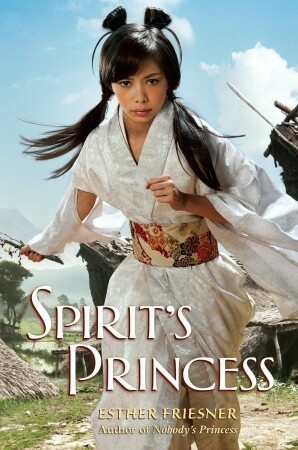 I've liked a lot of the Princess Myth series novels but this one was a bit hard to get into. I found it interesting reading this novel as I have never heard of Himiko before. Himiko was a great central character for this book. She's smart, headstrong, and always willing to do whats right. I loved her relationship with her family even though her family never stands up to her father. I loved the fact that Himiko wasn't afraid to stand up for what she herself believed in. I liked the descriptive nature of Himiko's world but I felt like everything moved too slowly in the novel. The slowness did make parts of the novel tedious to get through. However, the story really picked up in the end and left me wanting to read the next novel to see where Himiko's journey takes her. I would recommend this novel to those who like historical fiction.